Astonishing to drive to the end of this little palm covered island and find several huge high riser – 13 stories! 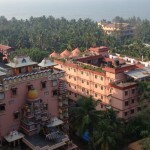 Amma attracts so many devotees they have had to build a number of dormitories. The Ashram is like a small village, with many shops, canteens and offices – only the old Temple with adornments. Amma wants the Ashram to be a place of the world – her sense of spirituality is love in action. Her NGO Embracing the World is embarked in an astonishing array of housing, tsunami recovery, hospitals, water projects, orphanages, schools etc. She is an incredible effective and efficient manifester. It’s hard for me to fully understand the notion of guru – but after learning about her life in the stunning video River of Love I am getting inkling: she seems to be a living saint, embodiment of the gods, essence of motherhood and unconditional love and compassion – day and night, tirelessly. While we were very glad we came – we decided just to stay a day: there is little happening on the Ashram without her here. And the various little shops or information or ecology centers have more closed hours than open. Our room was as basic as you can imagine: a mattress on the floor, two on little racks. Cement everything. No adornment of any kind. Dingy but clean. Couldn’t open the windows so it resembled a prison cell. I loved the meditation on the beach and the evening chanting. Though I can’t imagine what it would be like with 10,000 people: just with the 1000 we had to queue up and wait quite a bit to get the elevator to our place. Tiny elevator for 5 maximum (if no luggage) – the second elevator broken. I made many friends on the sloooow ride which typically stopped at each floor in the sweltering heat – using all my languages speaking in Spanish, French, German… I think this is the point of ashram life here: turn each challenge into an opportunity for meditation and love. The rest of the trip was a rough journey: this taxi driver was the opposite of aggressive and kept getting lost… But eventually we found the Ashram. The driver the next day to Thiruvananthapuram (Trivandrum) was efficient and we now appreciated the need to ‘drive by horn.’ Once in town – we joined another delightful home stay: our host and his wife fed us wonderful Keralan food. I love the breakfast: you have some sort of wonderful crepe or chapatti base (one day it was ‘strings’ of rice noodles in a little patty like nest) with yummy curried Sambar – green mango and onions – to go on top. Today it included a hardboiled egg. 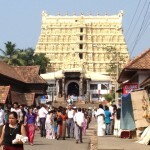 We stopped to see the Shri Padmanabhaswamy Temple – quite ancient for the first two levels (5000 years!) – with many ornately carved stories added in 18th century. It is one of the holiest Hindu sites in all of India, known as its spiritual heart – not open to visitors. We learned there is a huge (like the size of a building) reclining Vishnu statue with serpent. And they recently discovered three treasure chests: they’ve only opened one and it contained TRILLIONS of rupees worth of treasure – gold, jewels, etc. The place is heavily guarded and there is great controversy about what to do with this unimaginable fortune. This is adjacent to the Puthe Maliga Royal Palace. It’s only 200 years old and built in exquisite ornate lavish detail: each ceiling carved in unique intricate Rosewood patterns. Outer windows supported by ‘happy horse’ heads. 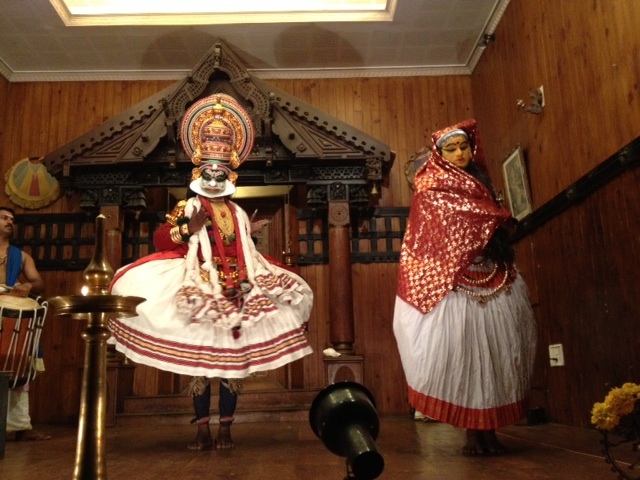 Stunning life size statues of characters from Kathekali. A huge throne made of intricately carved ivory (from hundreds of tusks) and another huge throne made wholly of crystal. Wonder after wonder. After a wander in the bazaar, we took a rickshaw to get out of the sweltering heat for lunch and managed to find a fanned India coffeehouse – a cooperative worker-owned small chain: we found the one in a windy little tower where you walk up the rather steep winding ramp and find the booths along the side – the walls in open brick – all the waiters in nifty turbans with a peacock like twist. Charming! Later we went to the Zoological gardens (served as basis for the film, Life of Pi) … in a lovely park like structure, but the enclosures made us sad for the animals. And too too hot and sweaty! 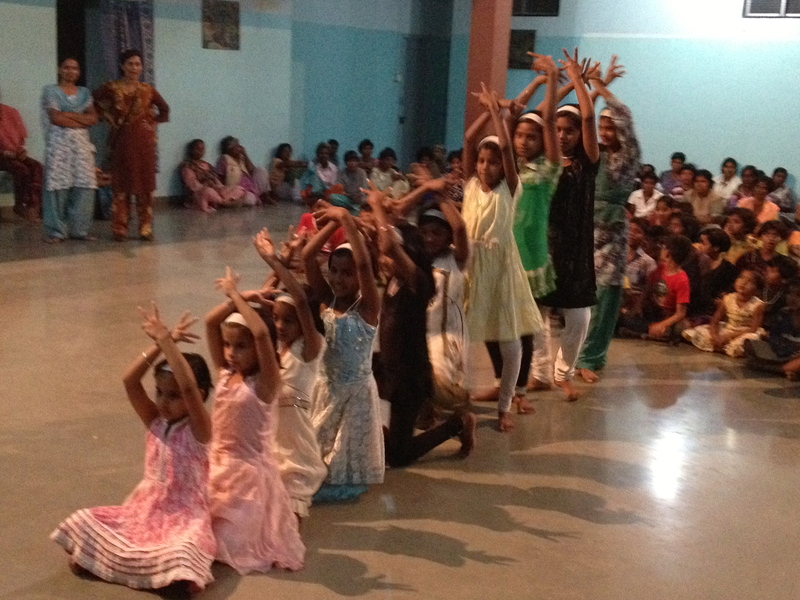 The peak of our time in Thiruvananthapuram was a dance recital our host took us to at a local government run Cultural Arts Center. 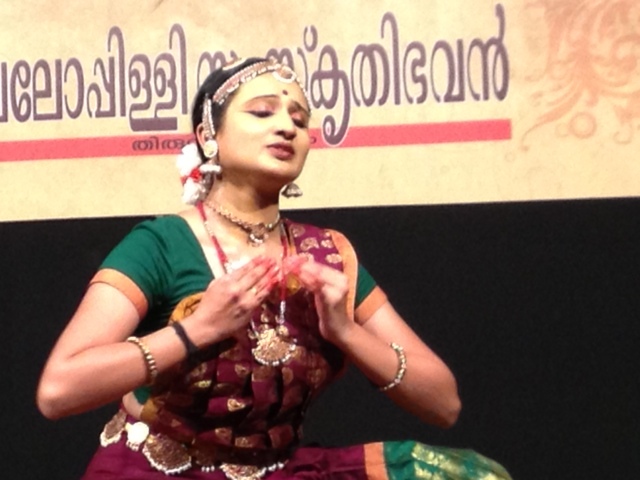 The young woman provided to be a magnificent dancer of classical Indian dance – Kerala style I suppose. Her every gesture and facial expression was the most expressive I have ever seen: every moment a specific position of eyebrow, eyes, lips, head position, hands in mudras – feet… etc. We could ‘read’ the text of every moment of the story of the dance. And she was so exquisitely beautiful. Her first piece was a welcoming opening where she clearly let us know how special and precious we, the audience, were to her and the deep importance of this moment for her in her life. One of my favorite pieces was her tender loving care of an infant … who then became a testy toddler she adoringly reined in… then a young child… who was gradually becoming more independent and leaving her loving embrace. Oh my – she reached so deeply into the vastness of maternal love and the connection with the child – the joy – the adoration… I was so deeply touched. When she did the final piece, now thanking us in the audience, expressing her gratitude and gratification (all of course only with movement – no speech)… I was in tears. She seemed like a beautiful flower at its moment of peak bloom – clearly having spent her whole life since a young young girl to reach this perfection… Her beauty and perfect body and grace – fragile – short lived… Her dance so deeply from the heart… Her focus and concentration so purely attuned from the spirit level. Wowowowowowow. This wonderful evening of dance was capped with a homemade Keralan feast back at our Guest House – where we were joined by a new friend Sabine who we met in Cochin. And of course Li Lu.